Brazil, the challenge of evangelization The Holy See charged of crimes against humanity remains silent. Here is why. «After putting aside God, or tolerating him as a private choice that should not interfere with public life, certain ideologies have tried to organize society through power and economy. But history shows us, in a dramatic way, that the goal of ensuring development to all, material well-being and peace ignoring God and his revelation has led to people receiving stones rather than bread». Benedict XVI is in Ancona for the 25th Italian Congress on the Eucharist. At the same time, it is the anniversary of 9/11. What does it happen when one abuses of the name of God? And what does it happen when one just does not consider the possiibility to believe in God? The answer is in the words mentioned above. But the thought of Ratzinger can easy be traced back. And it is all in that sentence – «stones rather than bread» – that recalls the Gospel of Matthew 7:9: «Which of you, if his son asks for bread, will give him a stone?». What is the bread if not the Eucharist? The synod of the bishops on the Eucharist was scheduled for October, 2005. It had been prepared under John Paul II, but in fact it became the first synod under Benedict XVI’s papacy. 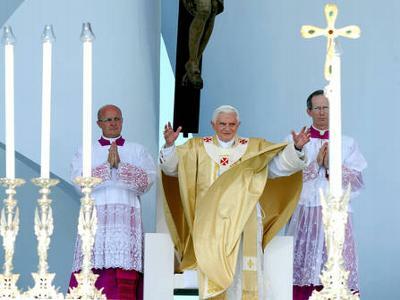 In his first homily as a Pope, Benedict XVI sustained that his program as a Pope was to follow the will of God. And will of God – the Pope gave it for sure – was also to focus the Christian life on the Eucharist. The Pope agreed that paying attention to the poors, the last of the earth is very important, and that this attention is part of the Church. But if Church does not focus on the Eucharist, it risks to lose its identity and its reason to be. It is sufficient to re-read the chronicles of that synod to understand how much Eucharist is important in the life of the Church. Cardinal Edmund Szoka, for example, went so far as to decry the fact that «some of our priests, and even some bishops, have lost their faith in the Holy Eucharist, and celebrate Holy Mass as if it were simply a professional duty. The result, as other European and Western synod fathers in particular complained, is a dramatic decline in Mass attendance». On the other hand, Cardinal Telesphore Placidus Toppo of India attributed to the Eucharist «one of the best success stories of the Catholic Church’s mission. In just 130 years,[my archdiocese of Ranchi has given birth to 12 dioceses, and produced 23 bishops, hundreds of priests, and thousands of religious». The Eucharist, he explained, has an extraordinarily liberating effect: «Our Christian tribals today have full confidence that Jesus’ saving death and resurrection has stripped the sovereignties and ruling forces of the universe and destroyed their power (Col 2:14-15). In this faith experience of our people, the Eucharist has brought about a paradigm shift from their former blood-sacrifices with which they tried to placate so called evil spirits, and reoriented them to the new and eternal covenant established in Jesus Christ». If one then reads the final propositions of that synod on the Eucharist there was something that has been a topic issue of Benedict XVI. Proposition 7, dealing with «The Eucharist and the Sacrament of Reconciliation» states that «love of the Eucharist leads to ever greater appreciation of the sacrament of Reconciliation, in which God’s merciful goodness makes possible a new beginning of Christian life and shows an intrinsic relationship between Baptism, sin and the sacrament of Reconciliation. Worthy reception of the Eucharist calls for the state of grace. It is a task of great importance that the Bishop promote in the diocese a decisive recovery of the pedagogy of conversion that is born of the Eucharist and that it favor, because of this, frequent individual confession. Priests, for their part, are to dedicate themselves generously to the administration of the sacrament of Penance». 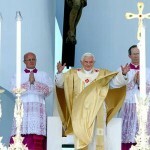 Benedict XVI underlined in several occasions the importance of the Eucharist. He did it in responding to pedophilia scandal with the letter to the Catholics of Ireland, and then with his choice to put the Church in Penance during his trip to Fatima. The last March, 25, during a speech to the participants of the Internal Forum of the Apostolic Penitentiary, he talked about of the pedagogical value of Sacramental confession. Benedict XVI underlines the need to focus on Christ in several ways. He did – for example – by introducing an innovation during the Masses he celebrates: the kneeling communion. But rather than an innovation, this is a return to tradition. The others are placing the crucifix at the center of the altar, «so that at the Mass we are all looking at Christ, and not at each other», and the frequent use of Latin «to emphasize the universality of the faith and the continuity of the Church». Yesterday, the Pope went to Ancona to conclude the Italian National Eucharistic Congress. The first International Eucharistic Congress was held in Lille, France, in 1881. But it was Italy that decided to hold frequently national congresses on the Eucharist. The organization of the Congress had its up and downs, which were the ups and downs of Italy, as well. During the Thirties, it consisted in big public adorations and processions that counter alter the big ceremonies of fascist regime. During the Fifties, after a long pause because of the Second World War, the National Eucharist Congress lives a sort of new life. In Ancona, the congress is aimed to give new life to the research of God. «Lord, to whom shall we go?» has been the theme of the Congress. The Congress was not held just in Ancona, but also in four other towns: Osimo, Fabriano, Jesi and Senigallia. Five tows, as five were the themes of the Congress: affectivity, frailty, work and feast, tradition and citizenship. The Eucharist prepares to life, and this is witnessed by two innovative appointments scheduled for the Pope: the lunch with redundancy payment recipients workers and the meeting with the young couple of fiances. The Eucharist is broken bread, shared for love. «See – mons. Edoardo Menichelli, archbishop of Ancona, said – people inlove oriented to raise up a famiy have a need, almost a urgent need: they need to be accompanied». The question of occupation fit in with the adoration. How to break the bread if the bread is not? Giuseppe Ruta, director of the Salesian Institute of Catania, told the experience of Confraternities by defining them a live place of the tradition of the Eucharist, and by considering them a place where to experiment love and peace. Before him, Angelo Bagnasco, president of the Italian Episcopal Conference, told during the homily held during the Saturday Mass in the Dome of Ancona that «there are motivated worries about the problem of occupation», and that is why the Catholic need to commit for it, because Catholics have always been «a special force able to have a vision and to network. A force that always gave its contribution to the common good. Catholics are conscious of the problems of today, but they are also aware of the historic responsabilities, and they want to challenge them». On one side, to attention for the social issues, that the Pope often mentioned during the speeches of the Angelus of Sunday; on the other side, the need to find the roots of the faith to build the Church again, this latter a topic that Ratzinger loves in a particular way. It is still topical the speech Benedict XVI addressed to the bishops of the North II Region of the Episcopal conference of Brazil on their ad limina visit. «I feel – the Pope said – that the centre and permanent source of the Petrine ministry are in the Eucharist, the heart of Christian life, the source and summit of the Church’s evangelizing mission. Thus you can understand the Successor of Peter’s anxiety about anything that could cloud the most original point of the Catholic faith: today Jesus Christ continues to be alive and really present in the consecrated host and cup». This is the path the next World Youth Day should follow. One Response to Benedict XVI to heal the Church. With Eucharist. The Vatican is one of the richest (concealed) entities on the planet. Helping the poor are words. Actions are what matters.